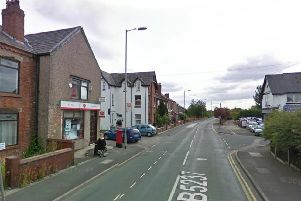 A middle-aged couple confronted by an armed burglar in their Wigan home were left terrified, a court heard today. Householder David Lavin encountered drunken 20-year-old Connor Kirby carrying a wooden stake, one and a half metres long, in the hallway having been alerted by noises late one night as he sat in the kitchen with his sick wife. And despite being nearly three times Kirby’s age he managed to disarm him and punched him to stop him leaving and to protect himself and his wife. At the time of the incident on May 7 this year Kirby was on bail accused of the manslaughter of 19-month-old toddler Ellie-May Minshull Coyle, who died in a “monstrous” caged bed in her Preston home on March 23 last year. Kirby was cleared of that offence earlier this month and was also acquitted of causing or allowing her death and two child cruelty offences involving caging the toddler in her bed and restraining her in it. The child’s mum, Lauren Coyle,19, and her then boyfriend Reece Hitchcott, 20, with whom Kirby was lodging at their flat in Ward Street, Lostock Bridge, were also cleared of the manslaughter but convicted of the other three offences and face sentence tomorrow afternoon (Friday). Kirby appeared today before the same trial judge, Mr Justice Dove, said: ”It was terrifying for people to find a stranger armed with a piece of wood in their house late at night and trying to steal their property. “Put yourself in their shoes, it must have been terrifying, someone much younger than them, fitter than them and armed. The courts take a very serious view of that behaviour. Kirby, of Octavia Court, Huyton, who has eight previous convictions, pleaded guilty to aggravated burglary at the house in Lake Walk, Kitt Green, Wigan. Christopher Tehrani, QC, prosecuting, told Liverpool Crown Court that 57-year-old Mr Lavin and his wife, Jill, were in the kitchen of their home about 11 pm when he became suspicious that there was an intruder and this was confirmed by the behaviour of their dog. He went to investigate and found Kirby, who had come in through the front door, in the hallway coming from the living room armed with a wooden stake. He had put on sunglasses which he had taken from a shelf in the hall and picked up a bag containing two insulin pens belonging to Mr Lavin. The householder pushed Kirby, who kept saying he was innocent, into the sitting room and fearing for his safety picked up a softball bat and pointed it at him and shouted to his wife in the kitchen to call the police, said Mr Tehrani. “On a number of occasions he had to push Connor Kirby back into the living room as he tried to walk out and leave the premises. At one point as he was walking towards him, Mr Lavin, acting in fear, struck on the head with the bat and pushed him onto the sofa and told him to remain. He did stand up but did not try to leave and about 11.15 pm the police arrived and arrested him. He removed the sunglasses from his pocket and when searched officers found the two insulin pens in his sock. When interviewed Kirby admitted he had been drunk but said he had no intention of using the stake. He said he only remembered stealing the sunglasses and a bag without knowing what the contents were. He had a black eye, cut lip, swollen nose and bruised elbow but claimed he had sustained them before the burglary, said Mr Tehrani. He said that Kirby, who was brought up in care, had a chaotic lifestyle and had never had to fend for himself before. He was on bail for 13 months for the toddler charges and has been in custody since the burglary.